I had a friend give me this little tip a while ago. I just made these again for myself yesterday and thought I would share, in case any one else wanted in on this little gem! I’m sure if you have kids you have chicken nuggets stashed in your freezer, and they probably eat them for lunch a couple days a week 🙂 We got to Costco and stock up on the dinosaur nuggets over here. Well if you are making them a batch and want a little more of a mom lunch for yourself; throw a couple more in the oven and then toss them in a tortilla for a tasty snack wrap! 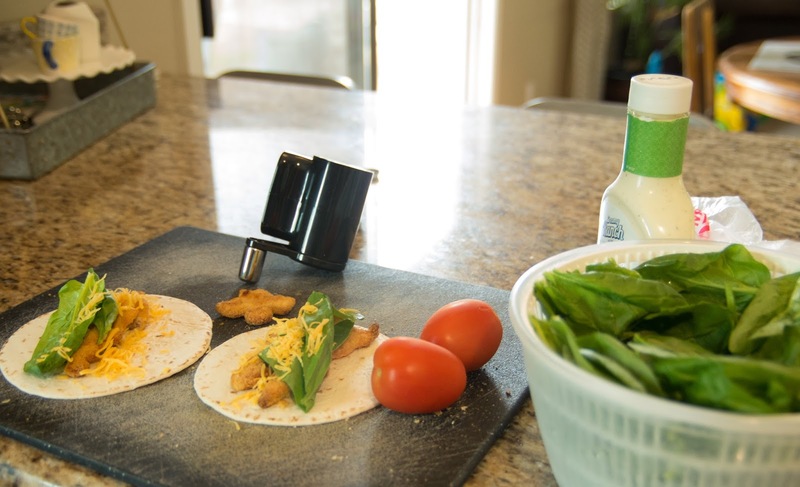 I just used ranch, shredded cheddar cheese, spinach greens and tomatoes to top mine, but here are some other options to make plain nuggets into an easy, yummy lunch. Then wrap it all up in your choice of tortilla and enjoy! Shelf makeover and living room update!